PREMIUM LOTS AVAILABLE IN THE HEART OF MOST POPULAR SADDLECREST. ONLY 10 LOTS AVAILABLE. FIRST COME FIRST SERVE. 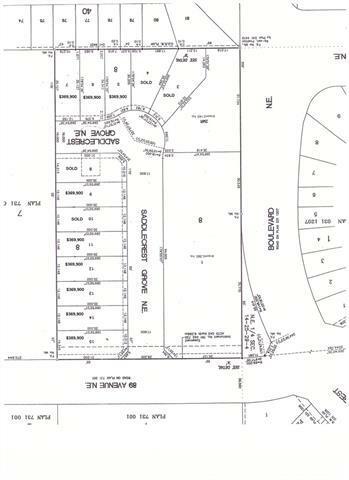 THESE LOTS ARE 40 FT X 115 FT. RARE OPPORTUNITY TO BUILD YOUR HOME IN AN ALREADY DEVELOPED AREA. BRING YOUR OWN BUILDER AND CUSTOMIZE YOUR DREAM HOME. THESE LOTS WILL NOT LAST AND ONCE THESE 40 FT WIDE LOTS ARE SOLD. PRICED TO SELL. ALL DEPOSITS TO BE PAID TO SELLERS LAWYER BY BANK DRAFT OR CERTIFIED CHEQUE. PAYMENT STRUCTURE IS AS FOLLOWS: 15% DEPOSIT; 35% UPON DELIVERY OF SERVICED LOT; 50% 90 DAYS AFTER POSSESSION. THERE ARE NO MORE. EXPECTED DELIVERY DATE NOVEMBER 2018. NOT INCLUDING POSSIBLE DELAYS - WEATHER/MUNICIPALITY ETC. CLOSE TO ALL AMENITIES. DONT MISS OUT!!! CALL TODAY.